Most people who’ve driven along Flanders Road in leafless seasons have seen the massive, boarded-up blue former boarding house peeking through the trees behind the Flanders Memorial Park. But Jamie and Keri Minnick, who bought the property for $150,000 in 2014, have been developing an $8 million plan to renovate the building and turn it into “The Brewster House Hotel,” with a restaurant and a swimming pool for the community to use. The property was in the hands of publisher Hugh Wyatt for many years — Mr. Wyatt had alternately listed the property for sale as a “turnkey 28-room hotel” and tried to rally support to turn the building into an African American history museum during his time as owner. The Minnicks have spent the month since the public hearing was announced circulating petitions and making the rounds of public meetings asking the Flanders community to rally behind their plan. The public hearing is being held after members of community groups compiled a list of the 15 most blighted properties in the hamlet, asking the town board to look into cleaning up the neighborhood. The Minnicks’ company, Restoration Equity Group, outlines their plans on their website, which is online here, and has started a Facebook page to rally the community around the project. The Brewster House holds an important place in Flanders history. It was once considered one of Flanders’ “grandest hotels,” according to Southampton Town’s Flanders Hamlet Heritage Area Report, online here. It has been known throughout its history as The Grove House, The Hallock-Fanning House and The Brewster House. 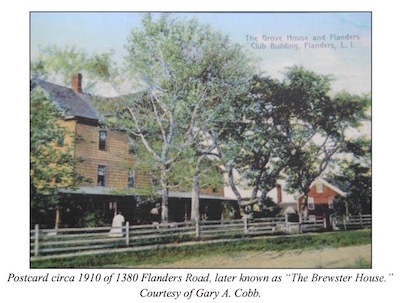 The Brewster family began operating the boarding house in 1922, and around that time the Flanders Club building was moved to behind The Brewster House to serve as a kitchen. According to the town report, the building served as a police headquarters in the 1950s, and Police Chief William Ashauer committed suicide there in 1959. The public hearing will be held this Tuesday, May 10 at 1 p.m. at Southampton Town Hall, 116 Hampton Road in Southampton. 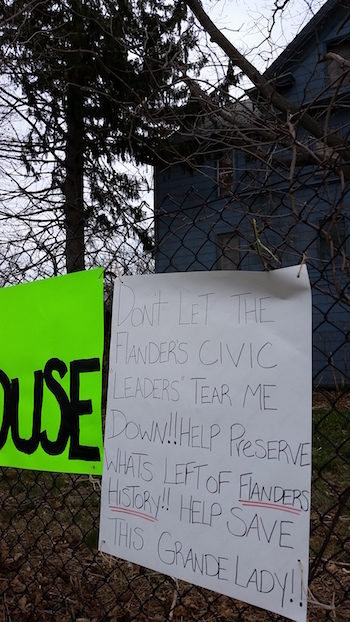 The Brewster House of Flanders: A Community Treasure or an Accident Waiting to Happen?